Price: £4 for May/June issue. Next issue 23rd July (possibly with monthly releases after that). UPDATE: Issues are now every three weeks, priced at £1.99. Snakes and Ladders game poster. Height chart with a picture of all the Numberjacks on the back. Pack of 30 Numberjacks Snap cards. Sheet of approximately 100 fairly small stickers. Comments: I never buy computer game magazines any more. I can read all the latest news and reviews online for free and I can download demos on Xbox LIVE. I don't need to spend five pounds on a print version complete with cover disc, poster and random gift. I do still sometimes wander into the newspaper aisle of the supermarket and fondle the plastic wrapper of Official Xbox Magazine, though. Then I crack open GamesTM and sniff the screenshots, soaking in the rich aroma of shiny, full-colour ink. But I resist the lure of retail therapy. I put them back on the shelf. I walk away. Well, I try... I look down to discover that Sproglette is busy fondling the plastic jewellery stuck to Disney's Princess Magazine and sniffing the stickers on the cover of My Little Pony. Ho well, at least Numberjacks is better than the pink, sparkly publications she normally pleads for. It didn't come with rash-inducing face glitter either, which, believe me, is always a bonus. If the Numberjacks TV show has passed you by, you should know that they're superheroes in the shape of numbers. They have a secret base inside a sofa and venture out to foil the dastardly mathematical machinations of meanies such as the Shape Japer and the Puzzler. 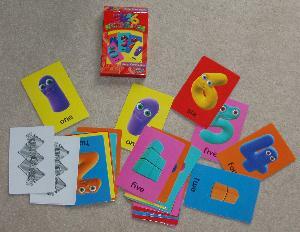 Yep, it's basic maths dressed up to be entertaining but it's great. The magazine version isn't quite so great but this seems to be the launch edition, so how representative of future issues it may be is anybody's guess. There are certainly a few teething problems. Most noticeably, at £4, it's a relatively expensive purchase. That's more in line with a book or toy than with the packet of sweets it's liable to be displayed alongside in the newsagents. It's not really the 'special treat' impulse buy you might expect. Also, at this price, the enclosed gifts need to be worthwhile. Unfortunately, it's hard to get excited about Snakes and Ladders and Snap. I mean, honestly, how long did it take them to think of those? What's next? Ludo and some crayons? It's a little lacking in imagination. We have countless versions of both games already. That said, the stickers, posters and cards are all decent quality and the Snap is made more interesting by the numbers being represented by their symbols on some cards and by counting blocks on others. There are also rules variations for different age groups. 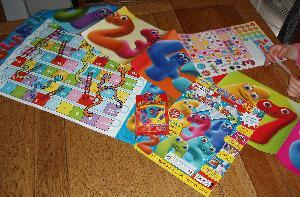 The magazine itself has plenty of puzzles and of suggestions for games to play. Some of the puzzles, such as matching the two halves of pictures of different types of food, are fairly trivial even for a three-year-old. A paper folding exercise at the end might stump a six-year-old. In general, a four-year-old should whizz through it (although they'll probably need help cutting stuff out). Some of the activities require the use of specific stickers which is a good idea. Others involve cutting shapes out. This is a bad idea - the relevant pages have different activities on the reverse. It's daft. Still, unlike many examples of this sort of magazine, it's not padded out with dire stories and colouring in. Numberjacks fans will love it. Conclusion: Worth keeping an eye on to see how it develops. Full of tips for parents to get the most out of it. Poorly designed cutting out sections. You might be as well saving the money and putting it towards a Numberjacks DVD instead. Do you really need more Snakes and Ladders in your life? 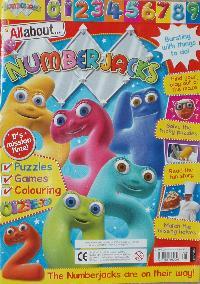 Did you know that the new Numberjacks magazine (out on July 23rd)is actually priced at £1.99? The 'All About' issue was a one off introduction to the Numberjacks - priced at £4. The new magazine will be available every 3-weeks. Excellent. Thanks for letting me know - I'll keep an eye out the next time Sproglette drags me down the magazine aisle at Tesco. I'll also had the info into the review. I bought it yesterday and it's fantastic! It's got a parents section too - I'll definitely be getting again. Might be a month or two until we get the mag, though. I've had to put a stop to special treats at the supermarket since I realised we have such a stockpile, we've still got chocolate coins from Christmas to eat!